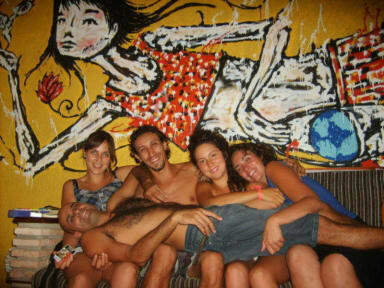 Nega Maluca Guesthouse i Salvador, Brasilien : Boka nu! The Nega is owned and run by long time travelers for the sole benefit of our other tribe members. It is more a philosophy and a way of life then a business. (You can read the 'we believe' part on our internet site). We have tried to put all the experience we have gathered from many years of traveling and sleeping in thousands of guesthouses all around the world, in our home. (The truth is that we mainly learned what not to do). A few little examples of this experience is a personal light for every dorm bed as not to disturb others at night, a personal electricity socket, a shelf for the top bunk beds, enough hangers for your cloths and towel in the room and especially in the showers and of course hot water, with strong pressure, 24 hours a day. 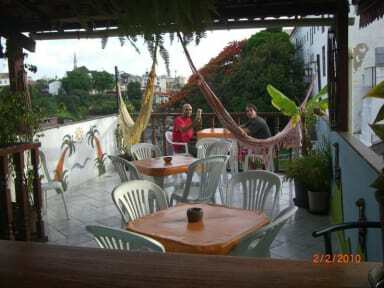 - Free and complete travel information about Salvador and the area. Despite the above, there is much more to traveling than just staying at a hostel who offers you all this great services for free. As travelers, the moment we left our home country we have in a way made the entire world part of our life now. We can no longer ignore the situation in Zimbabwe, the hunger in Brazil, the genocide in Darfur, cutting down the rainforest, pollution, global heating and unfortunately the list is endless. I know, we all have that feeling that we, the small individual cannot do anything about these big issues but as Obama said on his election campaign, YES WE CAN! We here in the Nega Maluca have been for years helping poor families in our neighborhood with basic food supplies financed from our money and donations travelers left for this cause. It is time to think bigger. We have stopped using plastic bags and now have recycled bags for the use of our guests when they go to the Super market. We are sponsoring on a monthly basis an orphan child in Mozambique whose parents died from aids (www.sos-childrensvillages.org). It takes only $1 a day to change a Childs life (less than a bottle of beer) and there is still so much more we can do. By staying in our guesthouse you are directly helping in these causes because part of all income is set aside for these matters. Don't get us wrong. Even if you don't stay with us, we will still continue financing these projects and looking for new ways we can contribute as these are our principals and beliefs in life and they are much more important than more or less guests in our house. However, together with you we can do much more than we can alone. We are located in the Historic centre of Salvador with its cobbled streets and beautifully preserved and painted colonial houses. Our house is on a quiet residential street, where locals still sit outside as the evening falls and talk about their neighbor's life :-). We are only 3 min. walk away from the centre of the action where live music and percussion bands play daily, for free, but far enough to enjoy some peace and quiet when the party is over and have a good night of sleep. We are a few min. walk from the only supermarket in the area, museums, travel agencies and basically everything you will need for your stay in Salvador. Note: All doubles are air conditioned as are the 8 bed mixed dorms + 1 10 bed dorm. We have left 1 dorm room with fans to give an option to those who are not fond of air con. Or want a more economical option. Last note. Promise: Payment in the hostel is in cash only. We do not accept any credit card. Reservations of beds in a dorm does not require any payment in advanced. For private bedrooms, since we have only three, must be done a payment in advance of 1 night. Very good place! Enjoyed it A LOT!! Salvador sparkning city! Ya man! !